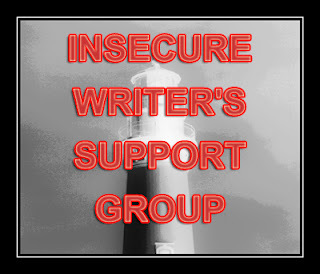 Welcome to the first Wednesday of the month and another round of the Insecure Writer's Support Group! This month (as the title suggests) I want to talk about rewriting. I'm doing just that with my novel EXISTENCE, in an attempt to tighten it up and make the plot have a better focus. The only problem is now I'm afraid it's going to be way too short and I'm not sure how to add more to it. I want it to be the best book it can be, therefore, I don't want to pad it with unnecessary fluff, but it needs something ... more. Has anyone ever had to do this? What suggestions do you have when it comes to rewriting? Augh, I'm in the process of completely restructuring my MS. It's a painful and daunting process but it must be done. So yes, adding, deleting, restructuring-- all on my plate. I end up having to do that a lot. A lot of my scenes just end up being dialogue on the first pass through so I go back and add to it. Setting, movement, things like that. I try to envision what the characters are doing while they talk, or what might be going on around them...that kind of thing. That happened with one of my books. Then I let a few more CP's read it and was able to see what I needed to add. It might do you good to just let one more person take a peek. That is just what my experience was though. sometimes it just takes time for the solution to come. Other times i ask my CPs for help with ideas. Tough one. So hard when it already feels small and perfect. Maybe it doesn't need more words? I hope the answer strikes soon! I haven't rewritten anything (though I might have to with this MS) but I have had novels that are too short. For me, it was adding another sub-plot that threads throughout the whole book. Or really it was another big event to carry it through the middle. I also went back and added more description because sometimes I forget that the readers don't know what it looks like in my head. I know what you mean about the cutting. Sometimes we do too much and end up having to add to it. Just make what you have rich--detail, emotion, connection. I've actually come to love rewriting, but then again, I've been writing so long that a lot of the manuscripts I've edited, revised, rewritten, and polished haven't been seen or worked on in many years. It's like reading them with a whole new set of eyes and having a much easier time deciding what to flesh out, what to axe, and what to radically rewrite. The main thing is to make sure your characters are consistent in actions, thoughts, personalities, etc., and that the plotlines don't have any contradictions or forgotten loose ends. This gets a bit harder to do if it's a very long book and you've gone over it many times already! I know what you mean! My first draft was just barely at 40k and I know I'm going to have to rework and cut a lot. So, I'm hoping that I ultimately add more (good stuff, of course) than what I have to take out! Listen to it. I can almost guarantee that you'll find scenes you missed or characters that need more page-time. As my work always tends to be on the short side, I unfortunately have no advice on not chopping too much out. But I hope it goes well, and that it won't be a concern - I wish you the right amount of words! Yep, I have the same problem; I always need to do a rewrite which involves strengthening and deepening. Don't add fluff--but dig deep into your character's motivations and emotions, and think of ways to richly convey his/her world. Have you read Cheryl Klein's Second Sight--best book on revision/rewriting I have ever read. Rewriting can be difficult, I say sit back and look at the main thrust of the novel - are there enough obstacles? twists and turns? Would your character act another way or what can you do to them - give it time - it'll come to you - and the very best of luck! Too short? I know how that feels. Run it by a critique partner or two - I bet they could find places where a little more is needed. I find that when my books are too short, I've forgotten to put something crucial in. Usually a paragraph to really get motivation across does wonders. But yeah, no fluff. Just make sure that you've characterized enough so the actions make sense. Good luck. Rewriting is a hard hard place. I've been revising my first hundred pages to send to a reader, and I don't have the cutting problem. I tend to add more stuff when I revise. Probably why I'm edging into epic territory with my novel. But, back to your question...I love showing the little details in a scene that only my character notices, and then relate them to her life and the plot in general. I probably get carried away with this sometimes, but it is an interesting way of bringing out more of your character. But, no, you don't want to pad your work with empty words. A tight manuscript is much better than a fat, sloppy one. I'm right there with you in the rewriting stage. It takes me a very, very long time! Hello from IWSG...Good CPs have helped me immensely with the rewriting process. A story that is shorter than average could still be acceptable. But if I wanted to beef up word count (something I learned to do for NaNoWriMo), I would flesh out characters some more and give more general plot details. Good luck. I wish I could help, but I am no good at rewriting - it stinks. I'm having that issue with my first WIP. I edited it and pruned it down, but now I fear it's too short. Man! I hope you figure it out. One of the things I was inspired by that I hope will help is someone who spoke at a conference I went to and said you should go through and make sure you've remembered to touch on all the senses. I always forget smell unless it plays a big part in the scene. So that's my goal when I go back through this next time: check to see if I've used all the senses. I'm facing a full rewrite on my NaNo, cutting out all the "fun" scenes and getting to the heart of the story, so reading the advise in the comments is great for me. I say don't worry about length, get the story written again. Then as you get betas and give it another read through you'll see those places that need to be developed. Willingness to cut is a good thing. My first thought was: Is there a subplot? Then: Do you have internal dialogue? Setting description? So much you can do. Think these things through and see what you come up with on your own. When you get stuck, it's time for other readers. Good luck. How do you know how much rewriting is required? Does it mean that there's a possibility that the entire story could change? It'll hit you when you least expect it, and when you're doing something mundane like dishes or brushing your teeth. I always go back to the 7 point structure and make sure I have all of my pinch points in place. The next place I look is at my characters. Are the challenges great enough? Is the conflict engaging enough? Someone told me to write scared...if you do that a great story with enough layers to get the reader to turn the pages will surface. I'm working on edits after a complete re-write, including change of POV. It is a lot of work. I'm hoping to get to the fluff part soon. Try having a beta reader and see if they have a comment that sparks an idea. Just a small suggestion. Good luck! Lots of things, but probably only one is what you need. Deepen the point of view, increase the tension, add a subplot, give plot and/or theme meaning to the setting with imagery and symbolism. I could go on, but those are good places for me to begin. I hear ya. I'm there too---complete and utterly messy revisions. I'm a little worried about what I've done, but all part of the writer's joy, right?